Stormy Times Ahead For Economy? The economy was growing solidly before hurricanes Katrina and Rita, whose double blow is expected to make for rocky business activity in the months ahead. A Commerce Department report released Thursday showed that gross domestic product grew at a 3.3 percent annual rate in the second quarter — confirming that economic activity was humming along at a respectable pace before the disasters struck. Also, the number of Americans forced out of work by Hurricane Katrina climbed by another 60,000 last week, pushing the total number of unemployed workers seeking jobless benefits because of the storm to 279,000. The latest weekly jobless figure from the Labor Department comes four weeks after the storm slammed into the Gulf Coast in late August, shutting down thousands of businesses and forcing people to evacuate. Analysts said they expect more jobless claims to come in from Katrina as a flood of applications is processed, many taken by unconventional means such as mobile units dispatched to shelters. Those claims will be mixed with jobless benefits that are expected to rise because of Hurricane Rita, which hit Texas and Louisiana last Saturday. GDP measures the value of all goods and services produced within the United States and is the best barometer of the nation's economic fitness. The 3.3 percent growth rate for the April-to-June quarter was unchanged from an estimate made a month ago. That performance met analysts' expectations. In first three months of the year, the economy grew at a healthy 3.8 percent pace. In the aftermath of the two hurricanes, however, economists are predicting that production and hiring will take a hit, slowing overall economic activity in the second half of this year to a pace of around 3 percent. Before the hurricanes, second-half growth was expected to top 4 percent. Federal Reserve Chairman Alan Greenspan earlier this week said the central bank will be closely monitoring the economy to assess the impact of the two deadly hurricanes, which slammed into the Gulf Coast over the last month. The disasters destroyed businesses, homes and hobbled essential oil and gas facilities, which has led to elevated energy prices rising even higher. Economists expect economic growth in the second half of this year will be reduced by as much as 1 percentage point as high energy prices crimp consumer and business spending, vital ingredients for healthy economic activity. Hiring is expected to slow. The nation's payrolls for September will probably show a loss of several hundred thousand jobs; the unemployment rate — now at a four-year low of 4.9 percent — is expected to rise. The employment report for September is released by the government next week. Rebuilding, once under way, should help energize overall economic activity and the jobs climate, though probably not until next year. Greenspan and his Fed colleagues last week said fallout from Katrina doesn't pose a "persistent threat" to the nation's economic health. But the disaster does raise more concerns about a pickup in inflation. Thus, the Fed decided last week to boost short-term interest rates for an 11th time since June 2004. An inflation gauge tied to the GDP report that is closely watched by the Fed showed that prices — excluding food and energy — rose at a rate of 1.7 percent in the second quarter. While this was slightly higher than a previous estimate, the figure suggested the Fed can stick with its course of gradual rate increases. Ben Bernanke, the president's top economist, on Tuesday said fallout from Katrina and Rita will have a "palpable effect" on the economy. 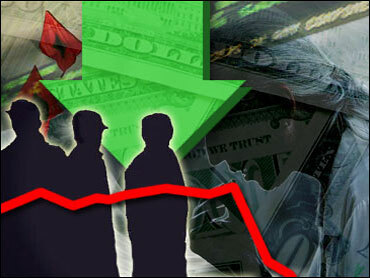 But he expected that to be short-lived, citing the economy's resilience in the past to shocks. The GDP report showed that consumers — the lifeblood of the economy — were spending at a good clip — despite high energy prices. Consumer spending in the second quarter grew at a rate of 3.4 percent. That was up from the previous estimate of a 3 percent pace made by the government last month, and followed a 3.5 percent growth rate registered in the first quarter. Business investment in equipment and software also was stronger in the second quarter than previously thought. This spending rose at a 10.9 percent rate, versus the 10.4 percent pace previously estimated for the quarter. In the first quarter, this investment grew at a 8.3 percent rate. The overall GDP figure stayed the same at a 3.3 percent growth rate because the bigger increases in consumer and business spending were blunted by other factors, including the fact that export growth in the second quarter turned out to be less brisk than previously estimated. A measure of corporate profits tied to the GDP report showed after-tax profits rising by 5.3 percent in the second quarter. That was less than previously estimated for the period, but marked an improvement from the 0.1 percent dip in the first quarter.